Asthomap - a comprehensive medicine for the treatment of respiratory diseases, especially those associated with allergic reactions. 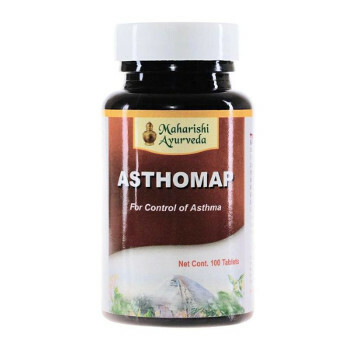 Asthomap restores normal breathing, soothes and relieves bronchospasm, reduces the cough, dilates the bronchioles and tones the respiratory system. Indications: allergic cough, bronchitis, allergic asthma, bronchial asthma, chronic bronchitis, pulmonary eosinophilia, emphysema, asthma. Composition: each tablet contains 3.65 mg Talispatra, Kali Mirch 7.30 mg 11.00 mg Shunthi, Pippali 14.55 mg, Vanshlochan 29.20 mg, Ela 7.30 mg, 3.65 Twak mg, Soma Lata, Yashtimadhu, Vasa, Kushta each 76.65 mg, Mishri 116.80 mg. Dosage: 1-2 tablets three times a day. Original name: Maharishi Ayurveda Asthomap. In our store You can buy authentic Asthma Maharishi at the best price!